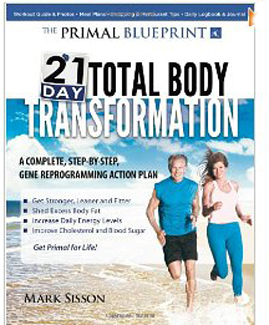 The Primal Blueprint 21 Day Body Transformation is a life-changing book. 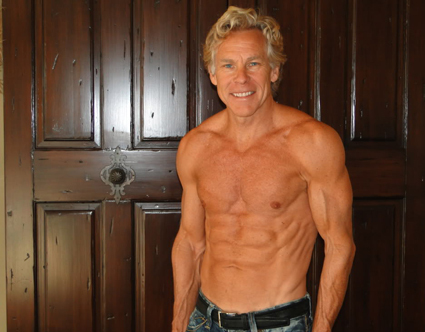 Fitness author, Mark Sisson, shows you step-by-step how to lose fat forever. I have one recommendation for this dynamic, inexpensive best-seller...Buy it now! Guys, how many times in the past couple months have you looked in the bathroom mirror and said to yourself, "I've got to get rid of this flab?" Sloppy love handles, a rounded and protruding belly, and just that overall "fleshy" look can make the first hour of your day a real downer. Have you started several diets or workout plans that seemed to fizzle after a few weeks because you failed to see even minimal fat loss or gain in muscle? Have you spent money on expensive, but truly worthless supplements, in an effort to get the lean, cut, athletic look that women desire in a man? The Primal Blueprint 21 Day Body Transformation can change all of that negativity, and give you the tools to stop looking soft and start looking tight. 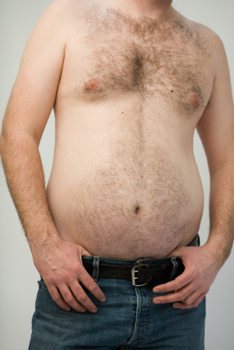 Male belly fat clobbers guys from two different directions. First, it has a direct correlation with health issues like erectile dysfunction, skin problems, heart disease, liver degeneration, and Type II diabetes. Secondly, fat on men is a sexual turn-off to chicks. Think about it: Why would she want to go to bed with this guy, when she could find someone with more ambition, more self-control, and a more athletic build? You should not have to take a backseat to any other guy when it comes having more fun, meeting more women, and getting a stronger build. Yes, you will have to give up eating crap food. Yes, you will have to slowly amp-up the intensity of your workouts, and yes, you will have to add a few ball-busting sprints to your cardio each week...but it will definitely be worth it. One bit of reality: The Primal Blueprint 21 Day Body Transformation is NOT going to give you a super-hero body in three weeks. It is going to provide you with the tools and strategies to make sweeping changes in your current diet and workouts, for the rest of your life, to chisel the body you want...and keep it. The Primal Blueprint 21 Day Body Transformation is about changing to a much more positive lifestyle. These 21 days can transform you from a sugar-dependent, fat-storing flab magnet into a what Mark calls "a fat-burning beast" where you are burning stored fat...both during exercise and at rest. Mark's book is a colorful, easy to read guide for getting the body you want by making specific changes in what you eat and how you workout. It is a 192-page legitimate blueprint for reprogramming your genes to become more fit, have more energy, and look years younger. High-carb/high-calorie and chemically-bloated crap foods are out. You will be expected to start eating like an athlete if you expect to look like one. Getting the build you want does not happen by magic. It took several years to get flabby and soft-looking, it will take both focus and effort to burn belly fat and become more tight. * Yes. You can reprogram your genes. * The keys to optimal gene expression are found in evolution. * Your body prefers burning fat over carbohydrates. * 80% of your body composition is determined by how you eat. * Grains are totally unnecessary. * Saturated fat and cholesterol are not your enemy. * Exercise is ineffective for weight management. * Maximum fitness can be achieved with brief, high-intensity workouts. Once you understand and implement these basic elements, you can start making better food choices, designing strength building workouts, and seeing results in the bathroom mirror. In order to get the body you want, you are going to have to start eating like an Olympic decathlete or an NFL defensive back. Mark is adamant about purging your refrigerator and shelves of crap foods that may taste delicious, but have been sabotaging you physique for years. In the Primal Blueprint 21 Day Body Transformation, Mark shows you in both words and pictures, the foods that do nothing more that look for places to store more fat on your body.You will now be eating more natural foods (those produced by Mother Nature), drinking more water, eating more protein, squeezing your own juices. * Sugar foods are the biggest culprit when it comes to butchering your physique. You will get rid of sugar cereals, donuts, pastries, desserts, and phony fruit drinks and energy drinks. * Starchy processed foods are next. Pizza, bagels, slabs of pasta, and bread are things that need to go. These high-carb/high-calorie foods do NOT help create muscle and they sabotage all of your hard work in the gym. * Solid protein sources like turkey meat, wild fish, grilled chicken breasts (and even buffalo meat and venison, if you choose) must be part of every meal and snack for you to build rock hard lean muscle. * You will now get your carbs from fibrous fresh vegetables and fruit. Plus, your total carbohydrate intake will be drastically reduced so you can blowtorch off the flab that hangs from your love handles. The Primal Blueprint 21 Day Body Transformation workouts are all about strength building with fundamental movements. Forget about nonsense like wrist curls, triceps extensions, and skull crushers. The intent of Mark's program is for you to train like an athlete...so you look like an athlete...lean, muscular, and fit. The routine you will learn during this 21 Day Challenge is very basic. You can learn more about Mark's weekly workouts in the gym at his his popular blog. * In the 21 Day Challenge, you will be introduced to what Mark calls, "The Primal Essential Movements." * These will consist of Push-Ups, Pull-Ups, Squats, and Planks...with variations. * Mark's workouts normally last about 30 minutes. You will sweat, get out of breath, and get red in the face. * You will be introduced to eight aerobic workouts of "extended duration" or "moderate duration." * You will have two "sprint workouts." * You will learn functional stretching. * You will learn the value of "play sessions." * You will learn the value of seeking different ways to move throughout your day to keep fat-burning at a maximum. If you have been frustrated in your attempts to lose belly fat, get rid of love handles, and get the kind of body you see as the ideal, you've found the right resource. Mark's book has become a best-seller for one simple reason...it gets results for guys who put in the discipline and effort to make significant changes in their lifestyle. The Primal Blueprint 21 Day Body Transformation has helped thousands of guys (and women) get the lean, athletic body they have dreamed about.